Despite the advances women have made in the workplace, they still account for a small share of top leadership jobs. That’s true in the fields of politics and government, academia, the nonprofit sector – and particularly business. We chose the Standard & Poor’s Composite 1500 index as our measure of corporate America because of its broad coverage, which spans all industries and all but the smallest publicly traded companies. The 1500 combines three other commonly used stock indices: the S&P 500 (companies with total stock-market value of $6.1 billion or more), the S&P MidCap 400 (market values of $1.6 billion to $6.8 billion), and the S&P SmallCap 600 (market values of $450 million to $2.1 billion). To be included, companies must, among other things, be listed on a U.S. stock exchange and either be headquartered in the U.S. or have at least a plurality of their business here. 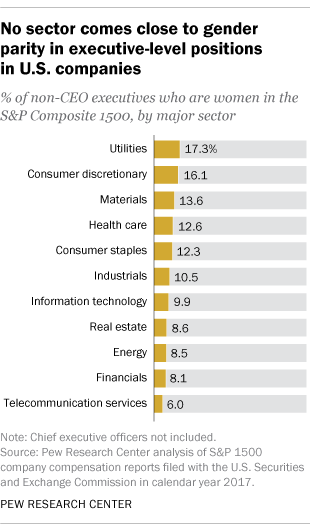 Companies in the 1500 are organized into 11 broad sectors and 67 primary industries. Altogether, the S&P 1500 covers 90% of total U.S. market capitalization, according to S&P Dow Jones Indices.